There is not much to say. We survived the night at 26,000ft, a very windy night, in which the tents tried to collapse on us a few times. In 3 hours , we are leaving for the summit. Hopefully the wind will have gone down when we hit the triangular face. May God grants us the strength to reach the summit and come back safely. From the office: Our team at Base Camp is following the climbers every step of the way! 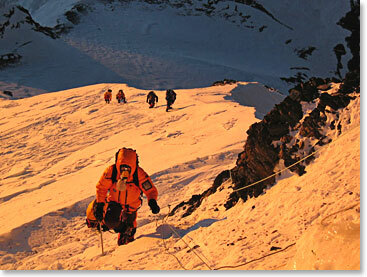 We wish them luck and will keep you posted as we receive more news of the climb.